Kingsmead is a cricket ground in Durban, KwaZulu-Natal, South Africa. Is the home ground of the KwaZulu-Natal Dolphins. It operates under the sponsorship-based name of Sahara Stadium Kingsmead where Sahara is the trademark of a sponsor from the IT industry. The stadium has been redeveloped over the years to accommodate 25 000 people, while keeping the old main grandstand and grass embankment. The ‘end names’ are the Umgeni End (north) and the Old Fort Road End (south). 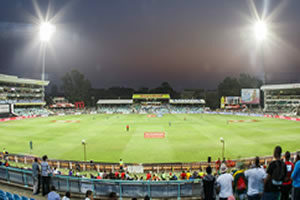 The venue hosted the first home Test for the South African cricket team after re-admission into international cricket. The first Test match to be played here was between South Africa and England on 18 January 1923, which resulted in a draw on the 5th day. Kingsmead also played host to a famous timeless Test match between England and South Africa in 1939 that lasted 10 days and ended as a draw when the English team had to catch their boat back to Britain. Kingsmead is a short distance from the sea quite close to the beach and the pitch actually sits below sea-level, which many believe offers changing conditions depending on the tide. Many batting collapses in matches in the past have jokingly been blamed on changes in the tide. Leading to the famous myth regarding how the tide affects batting conditions. Kingsmead’s easterly location – but within the same timezone as the rest of South Africa – means it is prone to bad light and the humid climate can result in powerful thunderstorms. Being in the centre of Durban makes it accessible by public transport, or on foot, but parking is limited. The stadium is used every other year for the finish of the Comrades Marathon, an ultramarathon run annually between Durban and Pietermaritzburg. Because the marathon alternates directions each year, it only finishes in Durban in odd-numbered years.